Update 1: Shoppy is now $0.99 in the App Store for an introductory price! Do you use a shopping list when buying groceries? 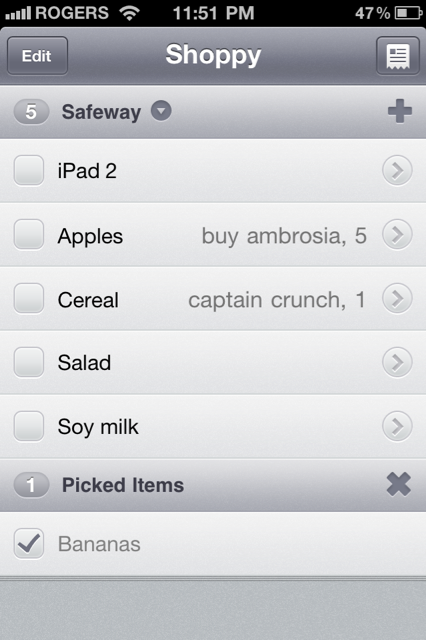 With the iPhone, there’s a plethora of ‘grocery list’ apps out there. One very interesting app popped into my inbox recently–Shoppy. Shoppy is an extremely simple app. While there are other free and paid options out there, Shoppy follows the K.I.S.S. rule–‘keep it simple, stupid’. 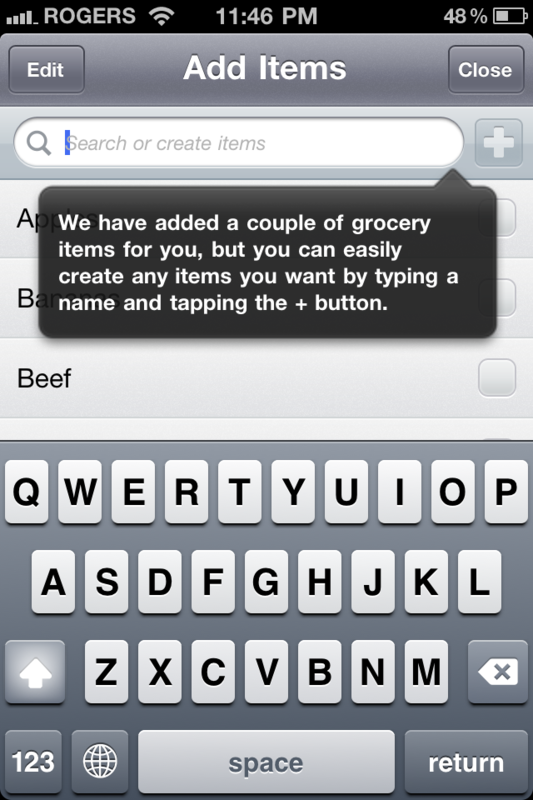 The app is designed to focus on your grocery list and nothing else. 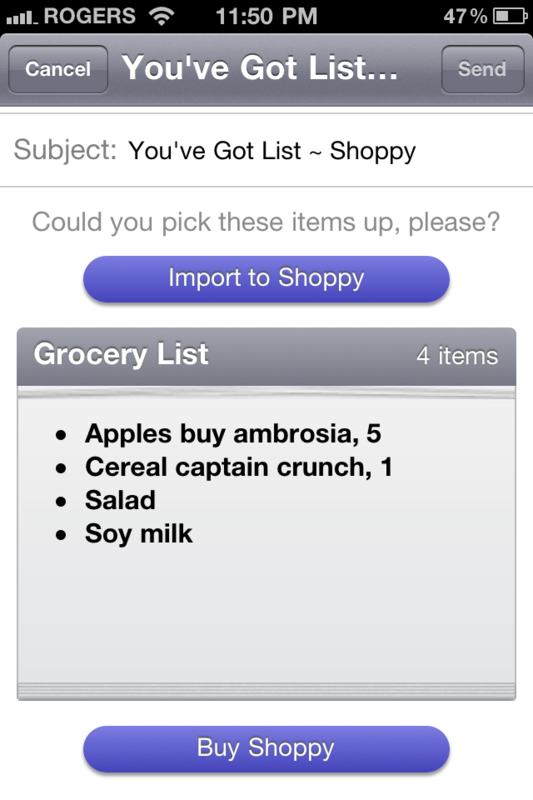 With Shoppy, there are some default grocery items to start, but the objective is to add your own items to populate the list. There’s nothing worse than sifting or deleting a list of pre-added items you’ll never see or buy. I liked that I only had my list to deal with and nothing else. Launching Shoppy for the first time includes hints and instructions on what to do–which is overlooked often by some developers. The instructions are clear on what to do first. 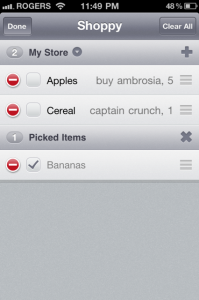 Tap the “+” button to add items to my grocery list, then tick off the items to compile a list. 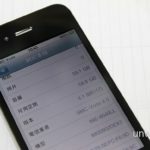 The order of items can be easily reordered or deleted and you can also specify quantity, unit, and notes for each item. You can add your favourite stores as well. What’s neat is that Shoppy learns and remembers the order of the items you pick per store, and displays them in the same order the next time you’re shopping. 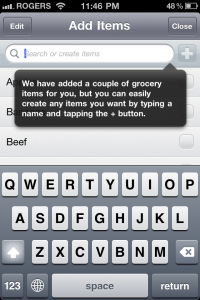 Other features include the ability to email lists, and a section for jotting down quick notes while shopping. 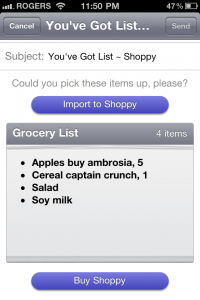 When users of Shoppy email a list to each other, there’s an option to import items right into Shoppy with one tap. I can see my wife having fun with this (maybe too much fun). Pulling down on the main list reveals the email and settings–a nice way to hide extra options. You can even ‘shake to checkout’ your list. Brilliant. Some changes I’d like to see in an update include the keyboard to be hidden by default when I want to add items to my list. It takes up half the screen so scrolling down list items is limited. Also, the addition of the alphabet down the right side (just like Contacts on the iPhone) would make for a fast way to find items. Is Shoppy Worthy of Being on Your Homescreen? 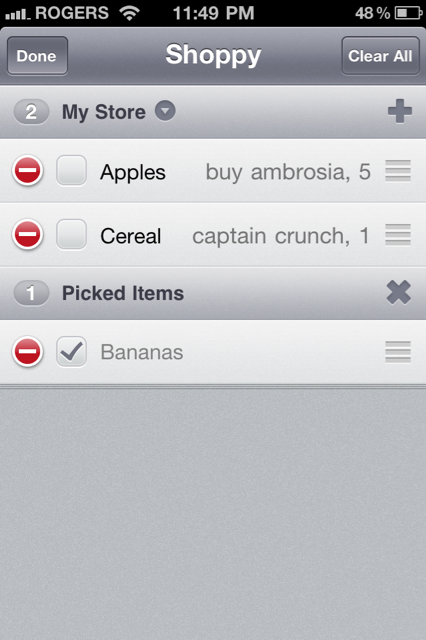 There are lots of ‘grocery list’ apps populating the App Store. There are free and paid options, but the simplistic design and ease of use of Shoppy makes it a worthy contender. This is coming from someone who never used grocery lists before. The grey colour scheme is subtle and calming, and doesn’t bombard you with colours, icons, or notifications. 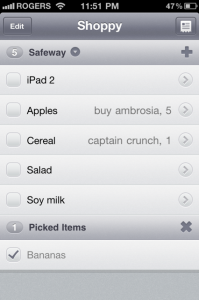 It allows you to concentrate on one thing–your grocery list. **edit: Looks like Shoppy is debuting for 99 cents right now! As for the $2.99 price tag, Shoppy is on the higher end of shopping list apps, but I feel the features and excellent design are worth it. However, I wouldn’t object to a $0.99 cent sale to showcase this app to the world though. Shoppy’s elegant design and interface, I feel is definitely worth every penny. Click here to download Shoppy in the App Store.